The Rebel Lightweight Wheelchair by Drive Medical is the perfect solution for those looking for a very portable and high strength wheelchair in one convenient box. The unit comes standard with quick release rear wheels which allows you to easily remove the large wheels on the back to fit tighter storing places. The Rebel Lightweight Wheelchair's back and frame are also foldable to fit almost any trunk and the swing away footrests are easily removed for convenient storage. The arm rests flip up to make transferring easy, fast and safer. 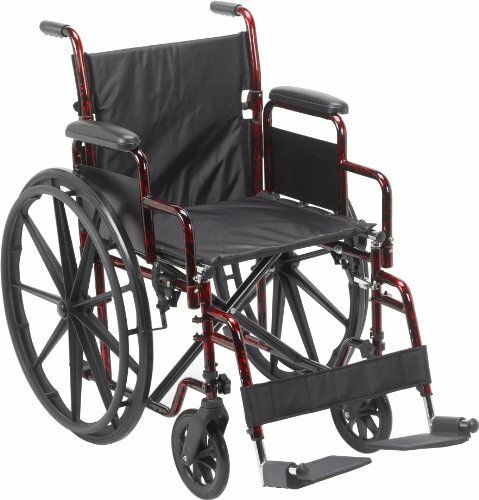 The Rebel Wheelchair is lightweight and very maneuverable making it extremely easy to turn in even the tightest areas. All of this and more makes the Rebel one of the best solutions for people who are always on the go and need a wheelchair.